Canadian Chris Hadfield, who dazzled Earth-bound star-gazers with breathtaking pictures, entertaining videos and a constant stream of poetic tweets during his time as commander of the International Space Station, has announced his resignation as an astronaut. Canadian Chris Hadfield has announced his retirement and his intention to move back to Canada following a 21-year career as an astronaut — most of it in the U.S. The newly minted Canadian icon made the announcement at the Canadian Space Agency just outside of Montreal on Monday, fresh off a visit with Prime Minister Stephen Harper in Ottawa. The 53-year-old astronaut had called a press conference at the CSA to share highlights from his five-month mission aboard the International Space Station where he dazzled Earth-bound star-gazers with breathtaking pictures, entertaining videos and a constant stream of poetic tweets. A release from the CSA Monday afternoon said Hadfield's "resignation is effective as of July 3," and added that he will use the opportunity to "pursue new professional challenges." "Chris Hadfield has inspired all Canadians, especially our next-generation of scientists and engineers," said parliamentary secretary Chris Alexander. "His exceptional career achievements make him a true Canadian hero and icon." The resignation means that Hadfield will finally return to Canadian soil. The astronaut has been living in Houston, Texas since his days as a fighter pilot in the 1980s. 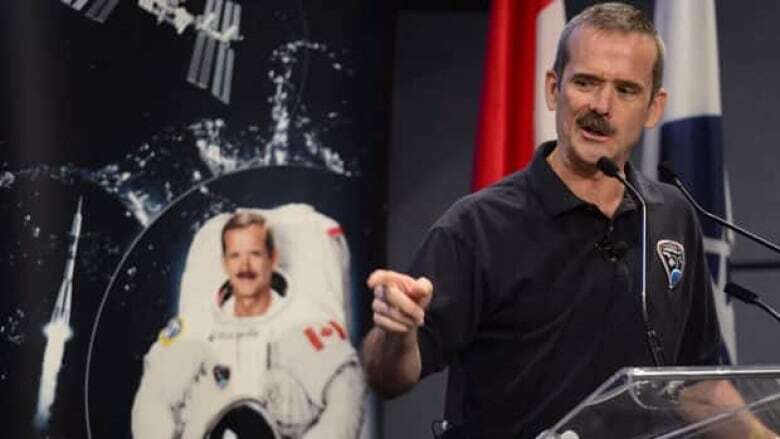 "[I'll be] making good on a promise I made my wife nearly 30 years ago — that yes, eventually, we would be moving back to Canada," Hadfield said. He said he's ready to pursue private interests, outside the government. Hadfield said he hasn't decided what he will do next, but said he plans to do presentations on space while reflecting over the coming year on his next move. "I've had such an interesting career and after 35 years it's time to step down. I'm the last astronaut of my class that's still around," he said. He added he's recovering his physical strength while readjusting to gravity and expects to be back to normal by around Labour Day. Hadfield said he's lost up to five per cent of his bone density in some areas. On the other hand, he said, because he exercised two hours a day while in space, he's able to bench-press more than he used to. How soon before another Canadian follows Hadfield into space? Hadfield and fellow crew mates, U.S. astronaut Tom Marshburn and Russian cosmonaut Roman Romanenko, undocked from the ISS on May 13, and triumphantly returned to Earth in a Soyuz capsule. Hadfield became the first Canadian commander of the ISS for Expedition 35, during which he performed over 130 science experiments and made numerous virtual visits to classrooms across the country. As commander of the ISS, he was responsible for the health and safety of the crew and the upkeep of the station. It was Hadfield's third space flight. He was the only Canadian to visit the Russian space station Mir in 1995, and the first Canadian to perform a spacewalk when he installed Canadarm2 onto the ISS in 2001. "There are so many young astronauts in the program. I would be an obstacle for them," said Hadfield.